Kingston University - A Record To Be Proud Of? 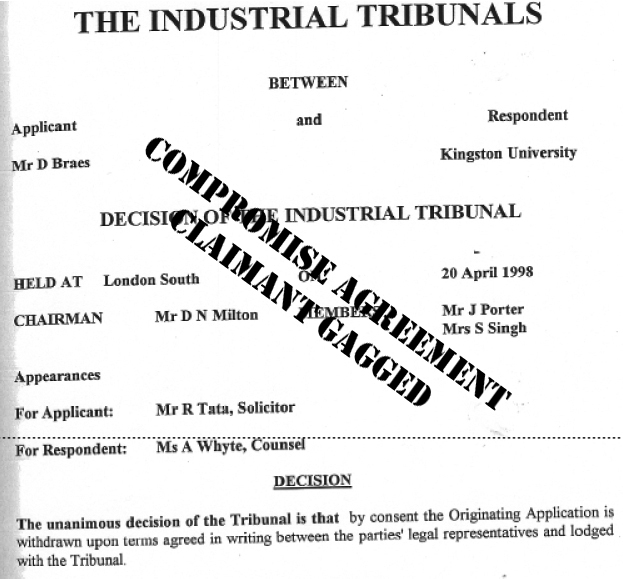 This section of the site provides examples drawn from the numerous Employment Tribunal and personal harassment cases filed against Kingston University by its employees and students since 1997, when Sir Peter Scott took over as Vice-Chancellor. 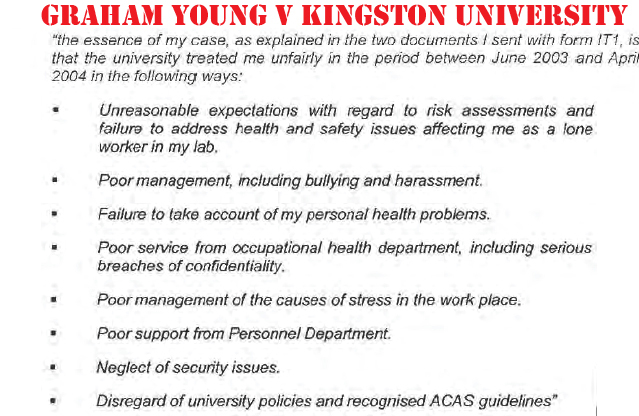 Initially, key excerpts from case judgments will be provided in order to give a brief overview of the most common issues affecting Kingston staff. As you read these excerpts, ask yourself if ALL of these claims, many of which were struck out without ever being heard, could possibly have been without merit? 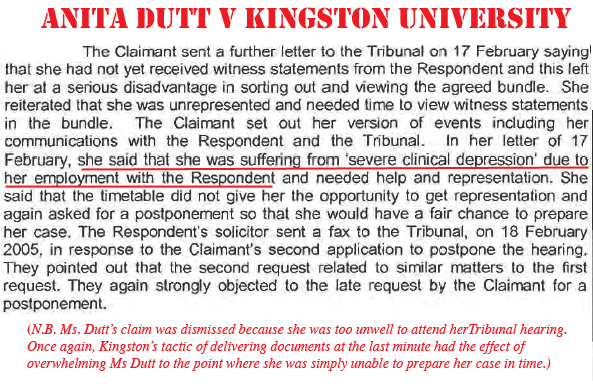 Or could it be that Kingston's treatment of staff and students caused such severe injuries as well as financial loss to these staff members so as to render them distinctly disadvantaged against Kingston University, with its highly paid team of barristers and solicitors -- all paid for at taxpayer expense? N.B. 'A Cunningham' is, in fact, none other than Prof Gail Cunningham, Dean of FASS, who was the author of a letter of dissmissal in the case of Dr Howard Fredrics. 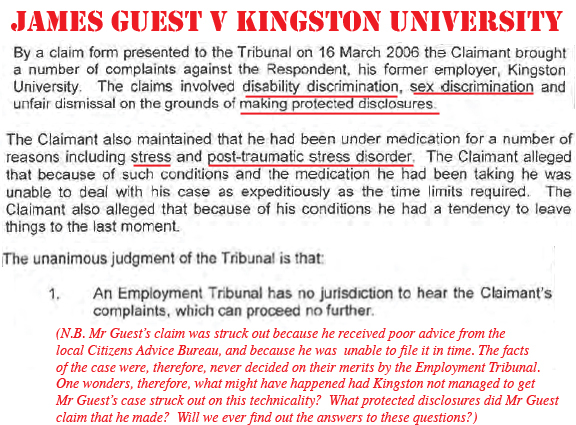 Kingston University has been served with a court injunction ordering it to stop harassing one of its disabled students. 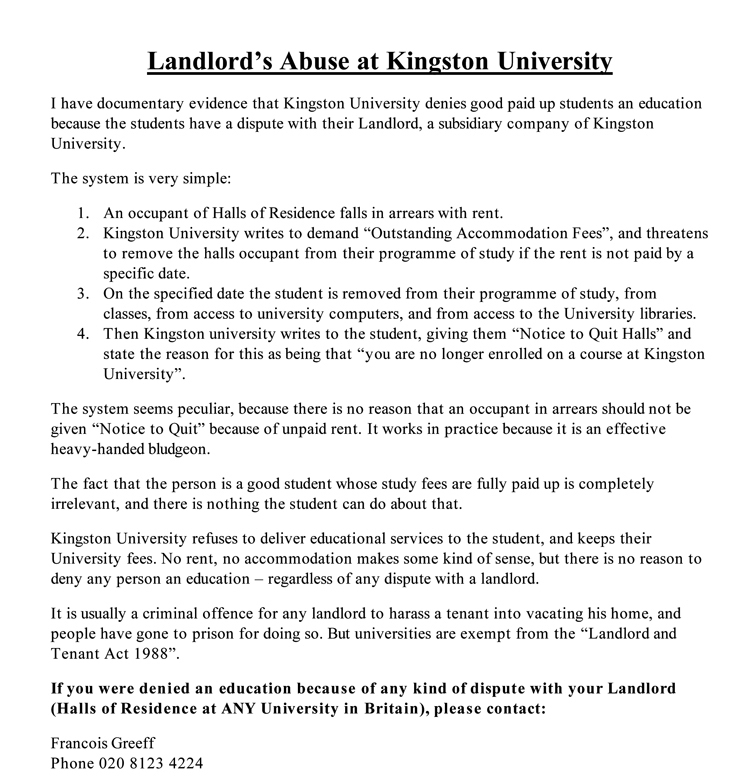 The order made by Kingston upon Thames County Court on September 14, says the university is forbidden, whether itself or by instructing or encouraging any other person, to harass Francois Greeff. 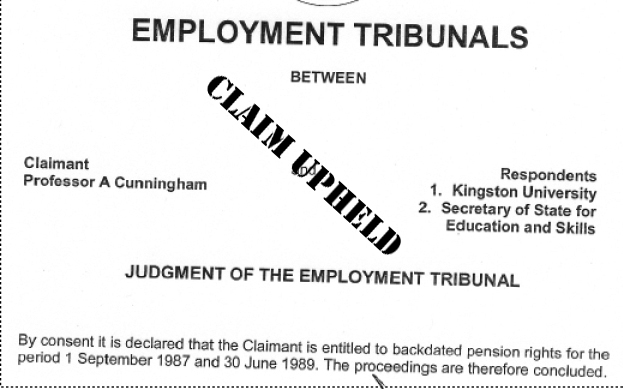 Failure to comply with an injunction can result in a fine, a prison sentence or both. Mr Greeff, who has bipolar affective disorder, was studying for a masters degree in business studies. 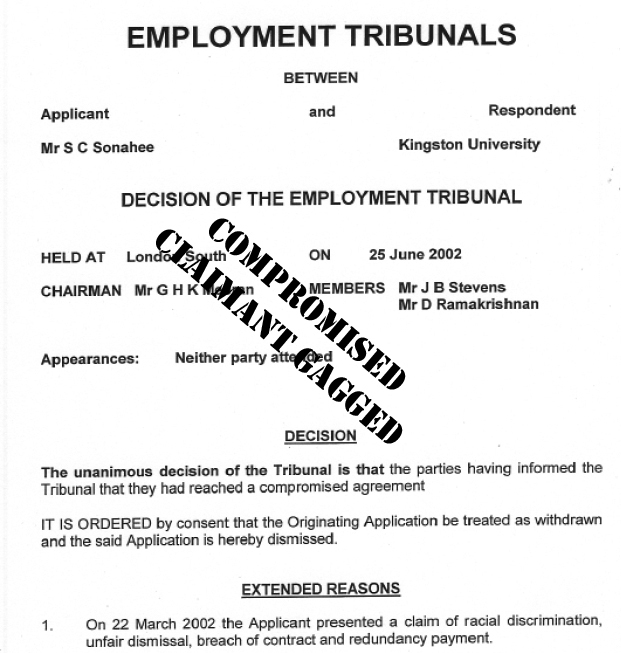 He was expelled from Kingston in July after a dispute that stretched back to last year, when he was found to be in breach of health and safety rules at his hall of residence. He was told to quit his room in February. Mr Greeff, who spent years living rough, told the court that the university had twice changed the locks to his room and had cut off his water supply. The university says there has been no harassment, stating that the locks had been changed because Mr Greeff had lost his keys and that the water had been turned off temporarily by workmen. 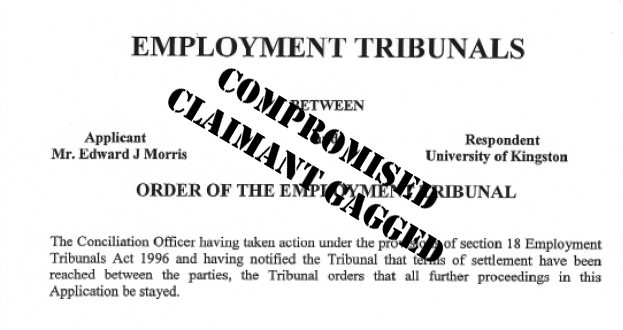 The university told The Times Higher that it had made every effort to resolve the dispute and had complied fully with the Disability Discrimination Act. It expelled Mr Greeff on the grounds of unacceptable behaviour towards staff and students. University representatives will appear before the court on Tuesday to request the lifting of the injunction. Mr Greeff's appeal against expulsion is due to be heard at the university on October 14.
the Central London County Court, Claim Number 5CL13107. Case Number on the Court Order is: 4KT03658, dated 14 September 2004. "You are an absolute c*&t get a life"
Higher Education, which has NO power to enforce its decisions. of the Landlord and Tenant Act of 1988? Does the University use its exemption from the Landlord and Tenant Act as license to, in effect, bully students out of their courses by cancelling their enrollment at the University if they fail to pay rent on their University-owned housing, even where there is a legitimate and ongoing landlord-tenant dispute in progress? If so, do you think it is right and fair for the University to use this sort of leverage to pressurize students into paying rent by denying them access to the education for which they've already paid in the form of student fees? MANY MORE CASE EXCERPTS - COMING SOON!